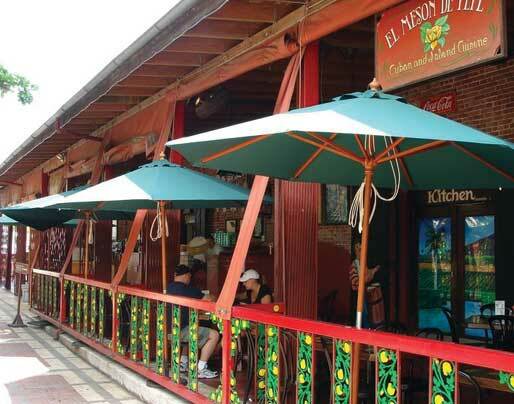 El Meson de Pepe's is a family owned and operated Cuban Restaurant here in Key West for over 20 years. Chef Pepe Diaz and family first opened in 1984, bringing locals and tourists alike delicious Cuban favorites. Now with 2 locations, El Meson de Pepe is dedicated to great quality food and the preservation of Cuban-Conch Heritage in Key West. The history of the association of Key West and Cuba is one of the most unusual and fascinating in all of American history. The two islands have been closely linked - culturally, economically, and in other ways for over 175 years. The marriage of the islands has encountered some turbulence, but all in all it has been a most happy one. It began in the 15th and 16th centuries, when Christopher Columbus discovered America and Cuba and Ponce de Leon discovered the Florida Keys and Dry Tortugas and La Florida. At that time Key West and the Florida Keys were inhabited by warring Calusa and other Indians who fished and raised small crops.They preyed on small ships coming to the area from Cuba wrecked along the dangerous Florida Reef. As mariners and fishermen, Spanish settlers from Cuba came to the Keys and the Dry Tortugas in small boats, in search of fish, manatees, and the tasty meat and eggs of sea turtles and birds. They camped on the Northwest shore of Key West (now Mallory SquareSM) and returned to Cuba with barrels full of food to sell in the bustling markets of Colonial Spanish Havana. In 1815, shortly before Spain ceded the Territory of Florida to the United States, Don Juan Estrada, the Spanish Governor of Florida, granted the island of Cayo Hueso to Juan Pablo Salas. Salas, in turn, sold the island to John Simonton of Mobile, Alabama for $2,000.00 in 1822. Official settlement began in that year, with people coming from near and far - from the east coast of the United States, the former Spanish city of St. Augustine, the Bahamas, Europe, Cuba and other places throughout the Caribbean. During the years that followed, Key West boomed. The lucrative shipwreck and salvage business soon made the geographically small and remote city the wealthiest per capita city in the USA. The equally lucrative cigar industry was introduced from Cuba to Key West in the late 1860's. Sponging and fishing were vital to the economy. Tourism was to become the third boom in Key West history, with the opening of the Overseas Railroad, pioneering overseas flights and finally the Overseas Highway ... all making both Key West and Cuba readily accessible to tourists and businessmen. The building, now Cayo Hueso y Habana on Mallory SquareSM facing the waters of the Gulf of Mexico, was the site where thousands of refugees from Cuba disembarked on American shores during the 19th century. The entire building has been converted into a setting sure to please all who visit it, tourists and locals alike. Inspired in part by the imagination and historical accuracy found in the art work of native son Mario Sanchez, the atmosphere and design of Cayo Hueso y Habana interprets scenes of old Key West and its still existing Cuban flavor. The cuisine of Cuba quickly became part of Key West's food heritage when Cuban families began to settle on the island in the 1860's. The food served in Key West homes and restaurants was excellent, but lacked the spice and zesty flavorings the Cubans brought with them. Non Cubans on the island began including Cuban recipes in their daily menus, happy to find new tastes and flavors on their dinner tables. The highly seasoned but not too spicy Cuban food was a welcome change. The special aromas, so much a part of old Key West and other Cuban communities are still here. The smell of the fragrant tobacco of fresh Cuban cigars pervades the air, mingling with that of pungent garlic, onions, Spanish olive oils and other mouth watering scents from the kitchen of El Meson de Pepe's, a local family owned and operated Restaurant serving Key Westâ€™s locals and visitors since 1985.